Have you ever avoided a handshake because the person you just met appears to be lacking in personal hygiene or sneezing up a storm? On top of being awkward, avoiding a handshake, no matter what the reason, can be perceived as pretty darn rude! But there might be a way around this. A new study by researchers from Aberystwyth University in the United Kingdom found that bumping fists instead of shaking hands could be a way to avoid the spread of germs while still maintaining a bit of social dignity. While fist bumps, which involve briefly pressing closed fists together, have been used in sports and rap music circles as a greeting or gesture of congratulations, you might see them more often in the general public – for a good reason. 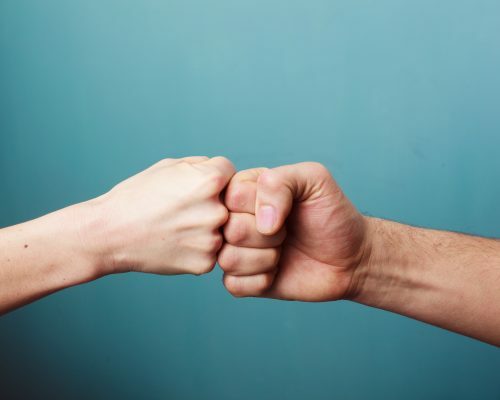 The U.K. study, published in the American Journal of Infection Control, found that fist bumps transmitted about 90 percent fewer bacteria than shaking hands. Study participants wore gloves that had been coated in a film of non-pathogenic E. coli bacteria, then either fist bumped, high-fived or shook hands with other participants who were wearing the same gloves. When the amount of bacteria transferred throughout the group of study participants was investigated, the results showed those who high-fived transferred about half the germs as the hand shakers, CBC reported. But with 90 percent less germs transferred with fist bumping as compared to hand shaking it might be something to consider. Now that you’ve figured out a slick way around the traditional handshake, there are also other ways to avoid germs without looking like you are terrified of them. This one is easy: If you’re sick, stay home! You might feel like a hero for coming to work or keeping that lunch date when you’re sneezing and sniffling, but those exposed to your germs probably don’t agree. Offices and small spaces are great places to spread germs because of the high volume of people and potentially poor air quality. If someone you know is sick, try to avoid close physical contact where you can. Cover your mouth and nose when you sneeze. This is another old rule of thumb. Try covering your mouth with the inside of your elbow instead of your hand when you can, or use a handkerchief or tissue. The theory is that using your elbow cuts down on the spread because your elbow won’t touch other surfaces to spread the nasties. Mind the rule: Always wash your hands! Being told to wash your hands is the germ-avoidance technique that people universally seem to know about. In fact, The Centers for Disease Control and Prevention (CDC) recommends proper and frequent hand-washing as one of the best ways to prevent the spread of germs. The Mayo Clinic advises washing with soap and hot water, rubbing your hands vigorously for at least 20 seconds, and rinsing and drying well. Clean up your dirty house! Britain’s National Health Services advises illness prevention by focusing cleaning on areas of the home where germs are most likely to be spread. That means thorough disinfectant or rigorous soap and water, The NHS’ suggestions include using disposable cloths and sponges or regularly disinfecting those that are non-disposable, flushing the toilet after each use, disinfecting bathroom sinks if they’ve been used by someone who’s sick and washing and drying your hands regularly. The next method might have you a bit squeamish, but it really has been shown to help. Getting an annual influenza vaccine is key for illness prevention. And the CDC says the flu shot isn’t just for you, but for certain populations that are more vulnerable to serious flu complications. Newborns and the elderly are two big populations who are very vulnerable to illness, yet they aren’t able to get a flu shot. Annual shots are recommended because the common flu actually has strains that “circulate” and change each year, and the shots are updated as a result. Take care of your body and use some of these methods to keep germs away this season!